Withings has been making some of the best fitness trackers for a couple years now. 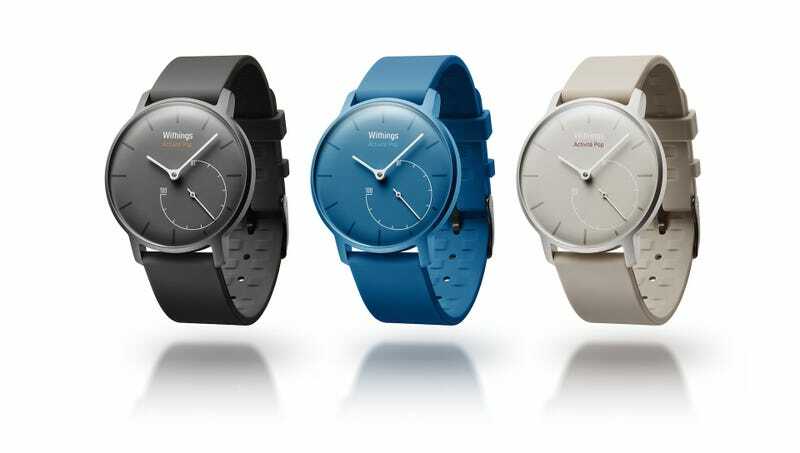 So when we first saw the Withings Activité—a lovely analog watch that was secretly an activity tracker—we were excited. That excitement waned, somewhat, when we found it it costs $450. Oh but hello, here comes the new Activité Pop, which looks almost as good as the original, but costs one-third the price. Consider us interested. The face of the Activité Pop looks basically identical to the original Activité. Both are dominated by a large analog clock. In the lower right corner there's a second analog dial which indicates how close you are to your daily goal (10,000 steps, for example). It still looks really good. There are no buttons on the watch at all; the whole thing is controlled by Withings' iOS app (the Android version doesn't yet support Withings' newest products, which is a pretty major blunder on their part). If you change time-zones, the watch will automatically adjust. It also has a vibrating motor for silent alarms. It's also the same in that it counts your steps as you go, and can also tell if you're running or swimming, and will log duration of that activity. It has automatic sleep detection, and will give you data about when you're in a light or heavy sleep. It's also waterproof to 30 meters (98 feet), which is more than most activity trackers out there. Both use a standard watch battery that should last 8 months before needing to be replaced. Oh, and it's also still very good looking. No one will ever guess it's an activity tracker unless you tell them. Basically, in terms of functionality, the two watches are identical. So how does the Activité Pop differ from the original Activité? Well the original comes with a calf-leather band and a silicone band for water activities. The Pop only comes with the silicone band. The original's face is made of sapphire glass, which is about as unscratchable as it gets, while the Pop uses a softer mineral glass. The original is made in Switzerland, making it a real Swiss watch, which is a thing that matters to some people. We don't know where the Pop is made, but it ain't Switzerland. The original comes in brown and black, while the Pop comes in "Bright Azure" (blue), "Elegant Sand" and "Shark Grey." But let's be real here: The most significant difference is the price. $150 for the Activité Pop versus $450 for the Activité. The original Activité is almost definitely the better, more durable watch, but for $450 we just can't recommend it unless you have plenty of disposable income. Yeah it looks great, but it doesn't do as much as some of the other activity trackers that cost half as much, like the Basis Peak. For $150 on the other hand... that might just be worth it for a watch that looks this good, that you want to always wear, and that you don't ever need to take off to charge. Hell, spend an extra $20 and get a band you really like. Ultimately, we're pretty excited about this watch and could see it actually being a hit.